Local businesses have praised an innovative wind energy business for its plans to commit a share of its contracts to local companies in South Lanarkshire. Banks Renewables has announced plans to direct a significant share of the estimated £62 million construction cost of a proposed wind farm in South Lanarkshire to local companies – sustaining and creating job opportunities and putting money into the local economy. Business owners in the area have welcomed the news, saying it will provide much needed investment and employment opportunities. The Hamilton based employer is awaiting a decision on its planning application to construct a 61.2MW, 18 turbine expansion to the already approved wind farm at Kype Muir, south of Strathaven. If approved, this would increase the total estimated local investment from the combined 44 turbine Kype Muir project to £145 million over the 25 year life cycle of the wind farm. 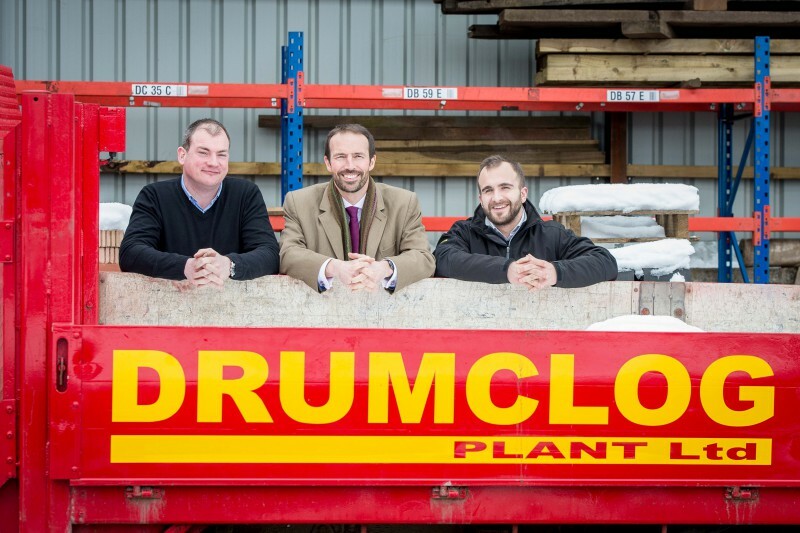 Ewan Turner employs 40 staff at Drumclog Plant Hire in the neighbouring village and is one business owner hoping the Banks Renewables plans are approved. He said: “When news broke of the wind farm at Kype Muir getting the go-ahead we were all delighted. “If the extension now gets the nod it will provide a further boost to the local economy of South Lanarkshire. We would hope to provide a range of our construction services, which include low ground pressure excavators and plant hire. “We’ve carried out work with a number of renewables businesses, but I have been particularly impressed with Banks Renewables’ communication and commitment to the local area, which I believe to be very genuine. During construction of the wind farm extension, it’s estimated that £10 million of direct contracts will be available to local firms for services such as construction and maintenance, accommodation, catering, cleaning, waste solution and fencing. David Hamilton, the managing director at Wm Hamilton & Sons Ltd, Haulage and Road Sweeper hire contractors based in Stonehouse, believes the local economy would benefit from the Kype Muir extension. He said: “This sort of work has an extremely positive effect on the local economy, and the boost is greatly needed in South Lanarkshire. “We’re hoping to work with Banks Renewables to supply materials and to recycle stone and soil on the site. In November, Banks Renewables and South Lanarkshire Council announced the launch of the first ever Connect2Renewables initiative. As part of the unique charter created by the two organisations, Banks has pledged to a level of investment through local firms during the construction of its wind farms in the region. Should the plans for the extension at Kype Muir get the go ahead, it would significantly increase the existing investment commitment and help to bring improved prosperity to the surrounding communities. Colin Anderson, development director at Banks Renewables, said: “The feedback we’ve had from local businesses so far has been fantastic and we appreciate more than ever the need to support local firms during these tough economic times. If you are a local business based in South Lanarkshire and keen to be included in the tendering process then please contact our procurement team at [email protected]. You will need to include your contact information, a short description about what your company does, how many employees you have, and if you have worked for the Banks Group previously. After you have emailed this information in one of our procurement team will get back to you. Under the umbrella of its Connect2Renewables Charter Banks Renewables’ wind farm at Kype Muir in South Lanarkshire provides a unique local investment and development opportunity that will promote and support the local economy by creating jobs, skills and learning opportunities, supporting local businesses, local infrastructure and the environment. Banks Renewables is part of the Banks Group (see: www.banksgroup.co.uk), a family firm founded in 1976, which now employs over 420 people in the renewable energy, property and mining sectors across Scotland and the North of England. To support this project, and help bring new jobs, investment and more carbon free energy to South Lanarkshire, please go to http://www.banksgroup.co.uk/kype-muir-extension/support-this-project/ now! It only takes a few seconds.